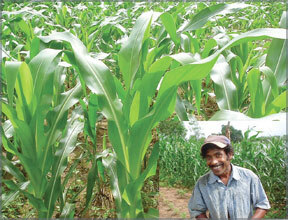 A farmer anticipates a bountiful harvest in one of the maize farms in Anuradhapura. The credit crunch felt across the globe would not affect the Sri Lankan market seriously, said Senior Economist, Financial and Private Sector Development, South Asia Region at the World Bank Colombo office Ismail Radwan. The Banking sector has shown a significant expansion during the first half of 2007 reflecting continued expansion in economic activity. CIC Agri Businesses signed agreements last week with over 2,000 farmers in the North Central Province to produce 15,000 mt of maize annually for the next five years which will save Rs 3.2 billion in foreign exchange.